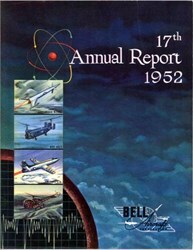 Bell Aircraft Corporation Annual Report issued in 1952. This historic document has the images of a guided missile, Navy HSL-1, Air Force X-1A, and Army H-13E on the cover in front of a background of clouds and is over 52 years old. This report 24 page includes lots of pictures, charts, graphs and financial information.